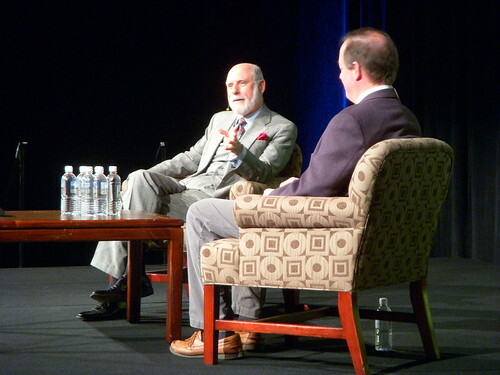 Chris Sherman interviewed Google’s Chief Internet Evangelist and VP, Vint Cerf in a very interesting keynote interview this morning at the SMX West conference in Santa Clara. Subjects touched upon included Cerf’s work on the Interplanetary Internet with NASA. It is a new standard to communicate from planet to planet, using radio/laser communications that are highly tolerant to signal degradation. Cerf also talked about search marketing, the tolerance/intolerance of users to advertising, and the high level of importance that Google places upon internet privacy. It was a very interesting session! This entry was posted in Happenings, Industry Happenings and tagged Google, Technology, Vint Cerf by Chris Silver Smith. Bookmark the permalink.